Convenient & Versatile: Mount your phone on dashboard or windshield, or any other surfaces, with easy 1-button. Powerful Magnetic Force: The strong magnetic holder can attract and hold your devices in place, even when angling is being adjusted. 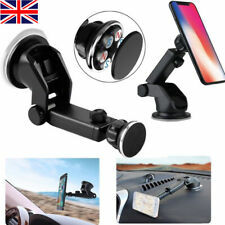 Features: 100% brand new and high quality Fashion appearance, unique decor to your car direct and quick installation Strong magnets inside hold your phone firmly 360° rotation support viewing at any of your desired angle. Ultra mini design, not block the line of sight while driving Support one-hand operation, very convenient Specification: Compatibility: Universal for phone Color: Black Note: Please allow 1-3cm (0.4-1.18") difference due to manual measurement and slight color variation for different display setting. Package Includes: 1 x Phone Holder (Holder only). 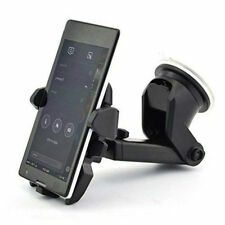 Universal 360° in Car Windscreen Dashboard Holder Mount For GPS Mobile Phone MP4 1. Suitable for any model of mobiles MP4, GPS or PDA 2. Button to regulate width from 45mm to 110mm 3. 360° rotating car holder 4. The main unit can insert 3-4 inch photo 5. Cupule & fast release button 6. Convenient,reliable and easy to use Package: 1x Car clip holder. 3- Fully adjustable with 360 degree rotation for quick portrait and landscape views. 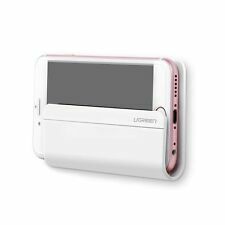 1-Easy one touch mounting system lock and releases the device with just one push of a finger. 6- Redesigned bottom foot ensures access to all your devices port. 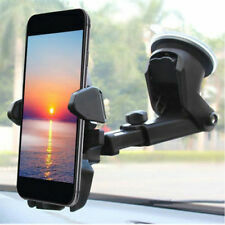 For Universal Magnetic Mount Holder. Premium Magnetic Mount Holder. Compatibility: Universal. The word of Mouth is very important to us, and your kindness and understand are ap precia t ed. Puts your phone at a comfortable viewing angle. Powerful Magnetic Force: The strong magnetic holder can attract and hold your devices in place, even when angling is being adjusted. 360 Degree Rotation: A flexible ball joint allow you to adjust the phone to any position and angle you want, with just one hand. Description: Extremely Strong Suction adheres to your windshield or dashboard. Easy to install and no tools required. Adjustable Clamp can hold devices up to max 3.54 inches(90mm) thick ,fits most types of phones on the market today. Red rubbers will keep your phone from getting damaged and scratched while mounted. Long Flexible Arm / Gooseneck Shockproof Design allows for easy positioning,and brings your device closer to you. Full 360 Degree Rotation with an adjustable clamp head . Features: Fits many types of smartphones on market,with screen sizes from 3.2"-6". Adjustable clamp can hold up to 3.54 inches for width. Shockproof design provides a secure and stable viewing environment Easy installation no tools requires. Strong suction with three layers, perfect for your car. Powerful applicability.It is suitable for all kinds of large-s ize screen p hone. - It won’t block your sight when you are driving and it won’t occupy too much space of your car. - It can hold your phone firmly whether it is thwart,upright or diag onal. This magnetic car mount pasted on dashboard, thereby it will not block your windshield or Air Vent for viewing. Car Magnetic Holder. Holder & Stand. This magnetic car mount is not bulky or space consuming. Please click here to buy it now Descriptions: Unique and compact design. 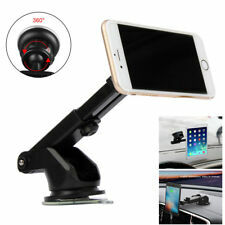 Super strong suction pad with sticky gel adhere to dashboard, windshield OR other surfaces Car holder for phone, compatible with GPS,for iPhone,for Blackberry,for Samsung,for HTC and most smart phones. Adjustable holding width from 0mm to 90mm, adjust to any size of phones. Adjustable rotation for 360 degrees. Product fixed on windows and center console. The ball joint of the holder allows swiveling and rotating 360 degrees for the best viewing on the device and for your convenience. Safe and non-toxic materials. The product can be washed easily under running water.